So 7 divided by 3 is 2 with 1 left over. The modulus operator turns out to be surprisingly useful. For example, you can check whether one number is divisible by another—if x % y is zero, then x is divisible by y. Also, you can extract the right-most digit or digits from a number. For example, x % 10 yields the right-most digit of x (in base 10). Similarly x % 100 yields the last two digits. The Python type for storing true and false values is called bool, named after the British mathematician, George Boole. George Boole created Boolean algebra, which is the basis of all modern computer arithmetic. There are only two boolean values: True and False. Capitalization is important, since true and false are not boolean values. In the first statement, the two operands are equal, so the expression evaluates to True; in the second statement, 5 is not equal to 6, so we get False. Although these operations are probably familiar to you, the Python symbols are different from the mathematical symbols. A common error is to use a single equal sign (=) instead of a double equal sign (==). Remember that = is an assignment operator and == is a comparison operator. Also, there is no such thing as =< or =>. There are three logical operators: and, or, and not. The semantics (meaning) of these operators is similar to their meaning in English. For example, x > 0 and x < 10 is true only if x is greater than 0 and less than 10.
n % 2 == 0 or n % 3 == 0 is true if either of the conditions is true, that is, if the number is divisible by 2 or 3. Finally, the not operator negates a boolean expression, so not(x > y) is true if (x > y) is false, that is, if x is less than or equal to y. The boolean expression after the if statement is called the condition. If it is true, then the indented statement gets executed. If not, nothing happens. As with the function definition from last chapter and other compound statements, the if statement consists of a header and a body. The header begins with the keyword if followed by a boolean expression and ends with a colon (:). The indented statements that follow are called a block. The first unindented statement marks the end of the block. A statement block inside a compound statement is called the body of the statement. Each of the statements inside the body are executed in order if the boolean expression evaluates to True. The entire block is skipped if the boolean expression evaluates to False. There is no limit on the number of statements that can appear in the body of an if statement, but there has to be at least one. Occasionally, it is useful to have a body with no statements (usually as a place keeper for code you haven’t written yet). In that case, you can use the pass statement, which does nothing. If the remainder when x is divided by 2 is 0, then we know that x is even, and the program displays a message to that effect. If the condition is false, the second set of statements is executed. Since the condition must be true or false, exactly one of the alternatives will be executed. The alternatives are called branches, because they are branches in the flow of execution. For any value of x, print_parity displays an appropriate message. When you call it, you can provide any integer expression as an argument. print x, "and", y, "are equal"
Each condition is checked in order. If the first is false, the next is checked, and so on. If one of them is true, the corresponding branch executes, and the statement ends. Even if more than one condition is true, only the first true branch executes. The outer conditional contains two branches. The first branch contains a simple output statement. The second branch contains another if statement, which has two branches of its own. Those two branches are both output statements, although they could have been conditional statements as well. Although the indentation of the statements makes the structure apparent, nested conditionals become difficult to read very quickly. In general, it is a good idea to avoid them when you can. print "x is a positive single digit." This condition is semantically the same as the compound boolean expression and the nested conditional. print "Positive numbers only, please." The function print_square_root has a parameter named x. The first thing it does is check whether x is less than or equal to 0, in which case it displays an error message and then uses return to exit the function. The flow of execution immediately returns to the caller, and the remaining lines of the function are not executed. In Input we were introduced to Python’s built-in functions that get input from the keyboard: raw_input and input. Now let’s look at these again in greater depth. What...is your name? Arthur, King of the Britons! Arthur, King of the Britons! Notice that the prompt is a string, so it must be enclosed in quotation marks. prompt = "What...is the airspeed velocity of an unladen swallow?\n"
What...is the airspeed velocity of an unladen swallow? What do you mean, an African or a European swallow? "What do you mean, an African or a European swallow?" To avoid this kind of error, it is a good idea to use raw_input to get a string and then use conversion commands to convert it to other types. It may seem odd that Python distinguishes the integer value 1 from the floating-point value 1.0. They may represent the same number, but they belong to different types. The reason is that they are represented differently inside the computer. str(ARGUMENT) will work with any value and convert it into a string. As mentioned earlier, True is boolean value; true is not. Python assigns boolean values to values of other types. For numerical types like integers and floating-points, zero values are false and non-zero values are true. For strings, empty strings are false and non-empty strings are true. 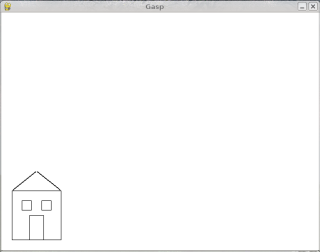 GASP (Graphics API for Students of Python) will enable us to write programs involving graphics. Before you can use GASP, it needs to be installed on your machine. If you are running Ubuntu GNU/Linux, see GASP in Appendix A. Current instructions for installing GASP on other platforms can be found at http://dev.laptop.org/pub/gasp/downloads. The second to the last command pauses and waits until a key is pressed. Without it, the screen would flash by so quickly you wouldn’t see it. 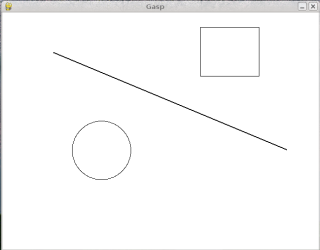 We will be using gasp from here on to illustrate (pun intended) computer programming concepts and to add to our fun while learning. You can find out more about the GASP module by reading Appendix B. A group of consecutive statements with the same indentation. The block of statements in a compound statement that follows the header. An expression that is either true or false. There are exactly two boolean values: True and False. Boolean values result when a boolean expression is evaluated by the Python interepreter. They have type bool. One of the possible paths of the flow of execution determined by conditional execution. A conditional branch with more than two possible flows of execution. In Python chained conditionals are written with if ... elif ... else statements. One of the operators that compares two values: ==, !=, >, <, >=, and <=. The boolean expression in a conditional statement that determines which branch is executed. A statement that controls the flow of execution depending on some condition. In Python the keywords if, elif, and else are used for conditional statements. One of the operators that combines boolean expressions: and, or, and not. An operator, denoted with a percent sign ( %), that works on integers and yields the remainder when one number is divided by another. One program structure within another, such as a conditional statement inside a branch of another conditional statement. A visual cue that tells the user to input data. An explicit statement that takes a value of one type and computes a corresponding value of another type. The process of adding a function header and parameters to a sequence of program statements is often refered to as “wrapping the code in a function”. This process is very useful whenever the program statements in question are going to be used multiple times. What happened with the last example? Why? If you were able to correctly anticipate the computer’s response in all but the last one, it is time to move on. If not, take time now to make up examples of your own. Explore the modulus operator until you are confident you understand how it works. Wrap this code in a function called compare(x, y). Call compare three times: one each where the first argument is less than, greater than, and equal to the second argument. To better understand boolean expressions, it is helpful to construct truth tables. Two boolean expressions are logically equivalent if and only if they have the same truth table. Which of these are logically equivalent? Analyze these results. What observations can you make about values of different types and logical operators? Can you write these observations in the form of simple rules about and and or expressions? Finally, modify the script so that user can enter ‘a’, ‘b’, or ‘c’. Test it by importing your script into the Python shell. Write a function named is_divisible_by_3 that takes a single integer as an argument and prints “This number is divisible by three.” if the argument is evenly divisible by 3 and “This number is not divisible by three.” otherwise. Now write a similar function named is_divisible_by_5. What will be the output of the following? print "Stop it! No more of this!" print "And now for something completely different..."
print "What's all this, then?" Explain what happened and why it happened. # is better to be explicit). Wrap the house code in a function named draw_house(). Run the script now. Do you see a house? Why not? 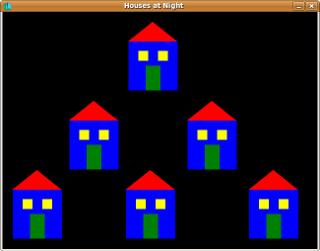 Add a call to draw_house() at the botton of the script so that the house returns to the screen. Parameterize the function with x and y parameters – the header should then become def draw_house(x, y):, so that you can pass in the location of the house on the canvas. Use draw_house to place five houses on the canvas in different locations. hint: You will need to use a Polygon for the roof instead of two Lines to get filled=True to work with it. © Copyright 2010, Jeffrey Elkner, Allen B. Downey and Chris Meyers. Created using Sphinx 1.2.2.